Most teachers require fifth grade students to participate in an annual science fair. Selecting a science fair project idea can become time-consuming and daunting if you do not know where to start. When you are thinking about what to do for the science fair, select a subject that matters to you, investigate the time it will take to finish your project and consider how you can obtain your materials. There are many interesting and fun science fair experiments for fifth grade students to conduct. The purpose of the experiment is to determine whether plants grow better in water or in soil. You will need cups, plant seeds, water, sunlight and a bag of soil. Begin by putting three plant seeds in a cup of water, and in another cup include soil and three seeds. Periodically, place both plants in sunlight. Then, watch what happens. After you complete the experiment, you learn that plants grow better when placed in soil. Although most seeds can grow in water alone, the process is slow and the plants are shorter. However, depending on the plant seeds you select, some plants will not grow at all. The objective of this experiment is to find out whether combining an additional substance to plant water changes a plant’s growth rate. Use a sugar and water mixture, a blend of salt and water, plain water, plant seeds, a bag of soil, and small paper cups for this experiment. Start by placing soil and a few seeds in three different cups, labeling the cups as “cup a,” “cup b” and “cup c.” Water “cup a” with the sugar water mixture, give “cub b” the salt water blend and “cub c” receives only water. Your findings should show that constantly adding salt or sugar to plant water reduces the growth of plants. These substances reduce the amount of water the plant receives when added to water. Over time, the plant shrivels and dies. The objective of this experiment is to show iron that there is in your breakfast cereal. You will need a strong magnet, a sealable plastic bag, water, a plate and iron-fortified cereal to conduct this experiment. Pour 1 cup of the cereal in the plastic bag, and then fill the bag halfway with water. Seal the bag and gently squeeze the mixture until the cereal dissolves and appears soupy. Shake the bag a few more times. Eventually you will notice metallic bits coming toward the magnet. After you have completed the investigation, you find that iron, the metal used to create nails, is actually located in the cereal. Chele, Kyla. "Science Fair Ideas for 5th Grade." 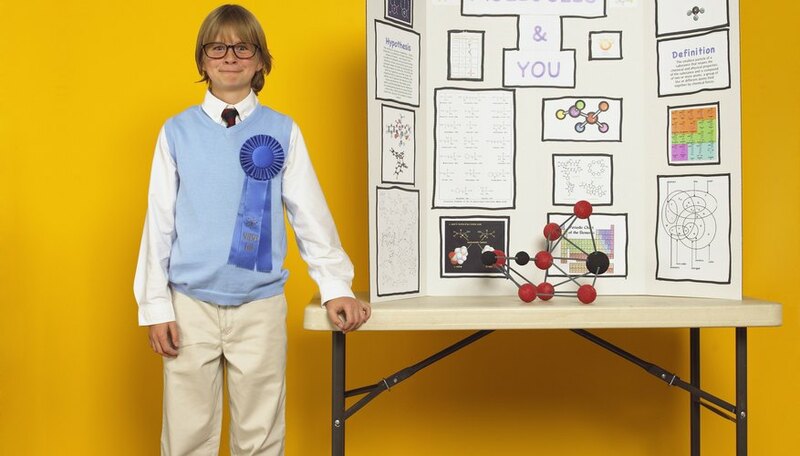 Sciencing, https://sciencing.com/science-fair-ideas-5th-grade-5936189.html. 24 April 2017.